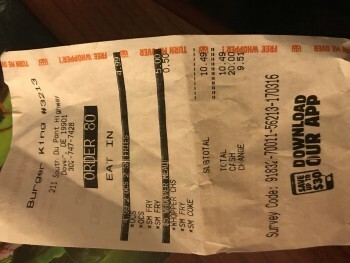 Burger King, South Dupont Highway, Dover, DE, United States - Got Food Poisoning? Report it now. “My son and I got Burger King last night, receipt #3213, our food was cold, I called a girl over and asked her why? She said if you want fresh food you have to ask for it! OMG wtf We took a couple bites of old food, I told her take it back and give us fresh food, but we suffered all night anyway? We’re still having stomach pain today Sunday, please check this place out, why did we get sick??? We’re they mad that we complained? And put something in our food,? Not washing their hands? Bad oil? I’m scared!!!! And can’t see my doctor till tomorrow, Monday.